Intelligencer clippings regarding the launch of the book "Burn this gossip, the true story of George Benjamin of Belleville" by Sheldon and Judith Godfrey, May 1991. Program for the 1967 Arts Festival, held at Centennial Secondary School in Belleville, Ontario. The Hastings County Board of Education: A Summary of the History of Schools by Bernard Wright, especially Belleville, and Sidney, Thurlow, and Tyendinaga Townships. Notes by Clyde Bell about his association with The Tweed News; includes history of the paper and a clipping from 15 April 1987 about the paper's 100th anniversary. File contains newspaper clippings on the 1889 Belleville Art Exhibit. File contains newspaper clippings on the Belleville Arts and Crafts Club and Arts Council, ca. 1968. 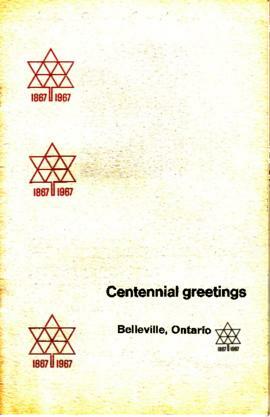 File contains a “Centennial Greetings” program for the c.1967 arts festival. File contains newspaper clippings on the 1969 Belleville Arts festival. File contains a history of the Belleville Bands starting in 1844. File contains a c.1969 newspaper clip on the Society for preserving and encouragement of barber shop quartet singing in America (S.P.E.B.S.Q.S.A). File contains newspaper clips of the Belleville Choral Society events, and a letter re: Belleville Choral Society. File contains 1934-58 concert series event pamphlet, 28th series concert events pamphlet c.1961-62, c.1961 membership renewal flyer, and 1960 newspaper clips of Leona Riggs as president of the Concert Association, and membership campaign c.1961. File contains newspaper clippings about the new Municipal Band leader, Alfred Cooper. File contains letters patent for the Belleville Opera House Co. c.1883. File contains a program and Book of Words for the c.1904 Philharmonic Society Concert.